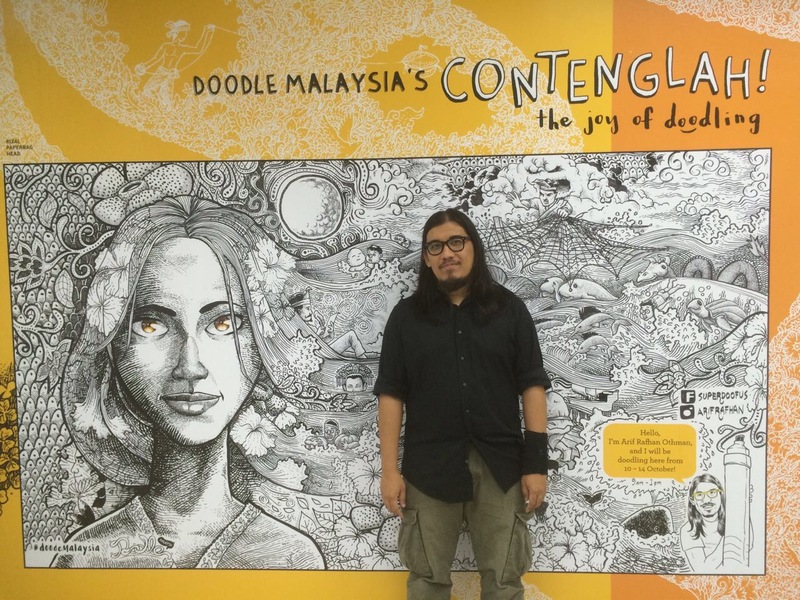 OUR LADY PEACEMy 4-day journey of creating a doodle mural in Masjid Jamek tunnel. When I was asked to do a live doodle by Allie Hill, I didn’t think twice about it. 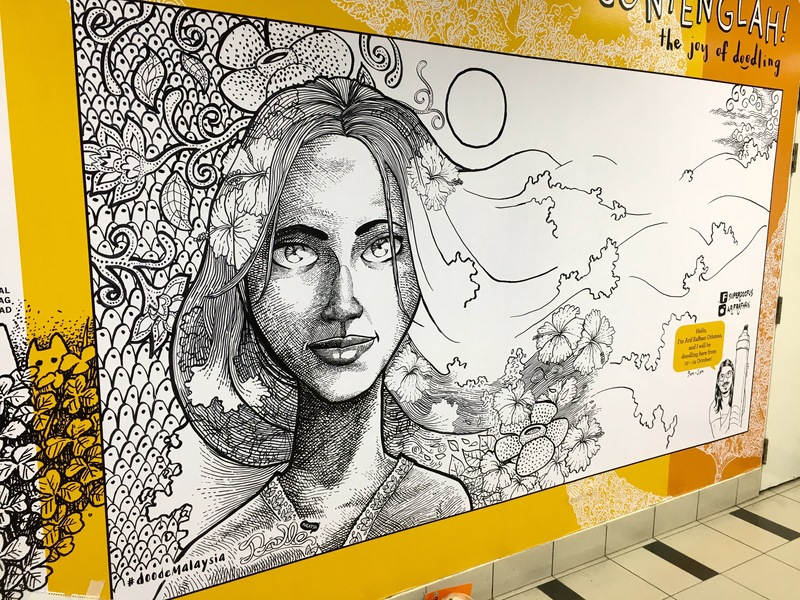 I thought the idea was great, and it will definitely create awareness and intrigue about doodling. I chose weekdays as my weekends are occupied with family activities. On the first morning, I began my ‘doodling journey’ by taking the new LRT line from Putra Heights. I arrived at Masjid Jamek station, had breakfast with Allie and then we proceeded to the place where I would be spending the next few days. When we arrived at the doodling spot, I took out my ‘weapons’ and started outlining. People didn’t seem to care as they were rushing to work. They walked so fast and close to me sometimes I could feel the wind behind me as they passed by. An hour passed, the tunnel was no longer busy, and then people started to stroll instead of run. A group of Bangladeshis stopped and watched me doodle in silence. They took pictures but didn’t say a word. I turned around to acknowledge them, and that was when they started talking and asking me questions. We took selfies and wefies, and they told me how amazing my work was (even though it was just 10% progress). I thanked them and they moved on. A group of Indonesian students stopped by and asked me to pose with them, first as a group and then individually… There were eight of them and they took turns to pose with me, with eight different poses; peace sign, peace on the eyes, duckface, shock-cute-face and many more. I just followed whatever they were doing, you know, for visual consistency… Then a family of Nepalis came and asked their daughter to pose with me. Then the dad, the grandma, the wife and the brother. I obliged. They asked about my motivation, my subject, my story and my age! Local: Good good good (while walking away looking at the painting. I don’t mind really. It’s funny. They are funny. We need comedy in life anyway, so it didn’t bother me that much. After few hours, my task for the day was done. My target for day one was to complete the girl’s face – Our Lady Peace – the main subject of my artwork. She’s our mother, she’s our nature and she gives birth to our culture and art. Our nature is very distinct and unique. Our culture and history is very much derived from our nature. I projected them on the wall in the form of fabric patterns, traditional dancing, folklores and myths. Once I was done with the face, I went home. Day two was pretty much a reunion day for me. As I was filling up the wall with folklore, flowery motives and creatures, my high school friends came to visit. People from RapidKL also paid a visit to record a time-lapse video. It was a sociable day indeed. There were also funny incidents. A group of Chinese tourists stopped and the girls praised the drawings loudly. I smiled. They continued walking, and less than 10 seconds later, the girls were punching each other and the guys were trying to break up the fight. Kenny Loh, a photographer who followed my process the whole week, speculated that my art must have provoked them and turned them into savages! I would love my art to invoke such emotion, or rather bipolar disorder! The rest of the week was pretty much fun and smooth; my wife and kids came visit, clients from my IT days came, I made some new friends and before I knew it, I had almost reached the final leg of the doodle. At one point I was stuck with this one empty spot which I couldn’t put my mind on. I didn’t know what to draw. Then I realized there was a girl standing behind me quietly watching. For how long? I didn’t know. I turned around and asked her what I should put in that spot. I explained to her my story and the elements next to the empty spot, which was a mermaid being caught by a greedy fisherman. She replied, “Mermaid? Then it’s dugong! People want mermaid but instead they got dugong.” Eureka! I asked her name and quickly drew dugongs in the empty spot. Thank you Mai for your insight. It fits perfectly in my composition. My final day was reserved for my biggest fear in completing the piece; the eyes. Yes, I wasn’t worried about the whole artwork, but I was worried about the eyes. My plan was to color the eyes to make the subject pop, to make the girl ‘talk’ to the viewer, to make the girl look ‘haunting’. As the crew from RapidKL and Kenny arrived, I took out my colored Sharpies and started to color the pupils. Thank God I managed to obtain my desired eyes while all eyes were on me when I was doing it. The amount of pressure was so enormous that as soon as I finished, I made a victory dance ala Michael Jackson. Before all of us embarked to different places, we spent almost half an hour just standing there, looking at the finished work. The sense of achievement overwhelmed me and I couldn’t stop looking at it with a huge grin on my face. It was done, finished, completed and I’ve got nothing else to say about that. 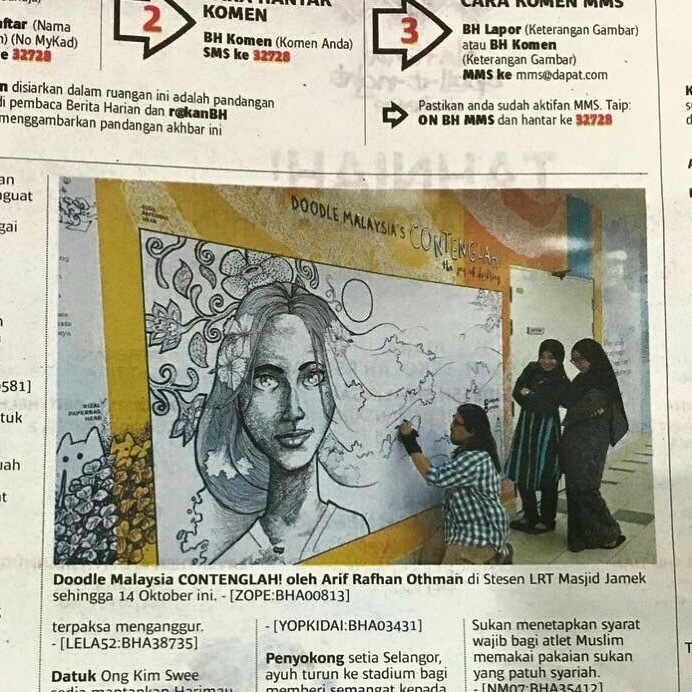 Thank you RapidKL, MyThinkCity and Doodle Malaysia for this opportunity. 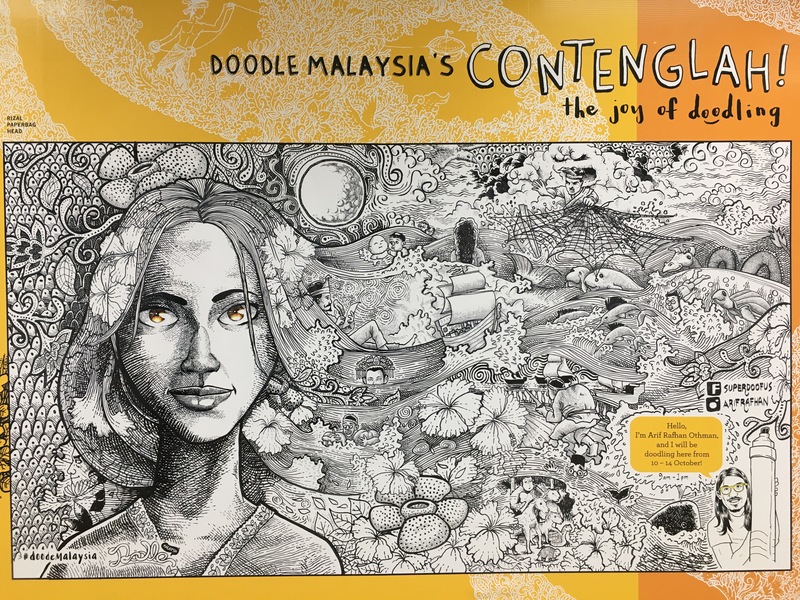 I really appreciate this chance for me to represent Doodle Malaysia and push my artistic capability to the next level. Thank you to Allie Hill, Kenny Loh, Redzuan Mustapha, my DM gang, families and friends who’d supported me those four days. You guys rock!